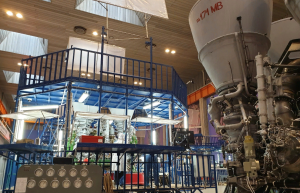 A new powerful engine for the Soyuz 5 launch vehicle has been assembled by the Energomash Development and Production Center in the Moscow Region. The first ‘tsar engine’ has been assembled at Energomash, the TASS news agency reported, quoting Roscosmos state corporation head Dmitry Rogozin. According to Rogozin, the RD-171MV engine is currently being prepared for hot-fire trials. “It is the most powerful engine in the world,” Rogozin wrote on Twitter. Digital design and manufacturing methods were used to create the advanced engine. It was earlier reported that the design, manufacturing of the prototype and trials will require some RUR 7 bln ($107 mio) from the budget. The rocket itself is being developed by Sergei P. Korolev Energia Rocket and Space Corporation (RSC Energia). Plans call for using the rocket to put the Federation piloted spacecraft into orbit.